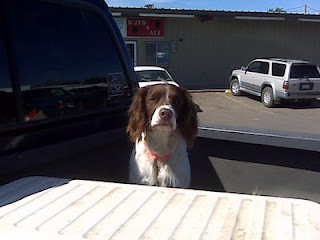 Why is Ace looking forlorn in the back of the truck? If you could smell the rascal, you'd know! He was working some real thick Alfalfa (I was looking right at him) he acted like he was making scent- then he jumped, yelped and ran up to me. I thought it was a porcupine and checked him over for quills. The wind was blowing pretty hard and he was down wind so I didn't smell him. Later, I caught a whiff of him and knew why I packed the Fabreze. I'll bet it was a mature skunk that hit him. It was really just a warning tap- a little shot right between the eyes! Old Mister Skunk was saying "Hey, dog, here's a little present! Come any closer and you'll be walking home because I'll make you stink so bad they won't let you in the truck!" Forget the tomato juice or any of that stuff. Fabreze breaks it down chemically and takes care of it. He's back in his box now- smelling outdoorsey fresh!! !